A warehouse worker at a rubber cooperative in Bo Thong, Chonburi, about two hours from Bangkok, stacks rubber sheets sold to the co-op by area farmers on a pallet at the receiving docks. The Thai rubber industry is in crisis. In just two years, prices have plummeted from a high, in 2012, of about 190Baht (roughly $6.10 US) per kilo to, in 2014, just 52Baht (roughly $1.65 US) per kilo. At the same time it costs about 64Baht (about $2.10 US) to produce a kilo of rubber. You don't have to be a Nobel winning economist to see that with farmers suffering a loss of .45¢ (US) for every kilo of rubber sold farmers are taking a huge hit. A rubber farmer in Nakhon Si Thammarat, the center of Thailand's rubber industry, committed suicide over the weekend allegedly because he could no longer provide for his family. A rubber tapper at a tree. Tapping a tree. 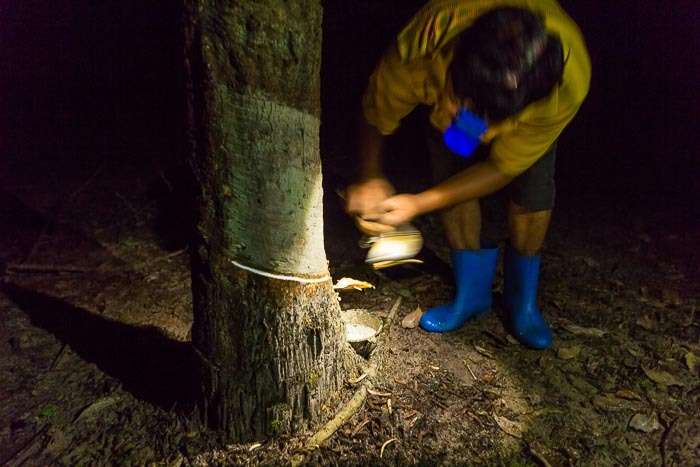 Rubber trees are tapped between midnight and 2AM, before the sun comes up and it gets too hot. The latex drips longer when it's cooler, before coagulating and sealing the cut. 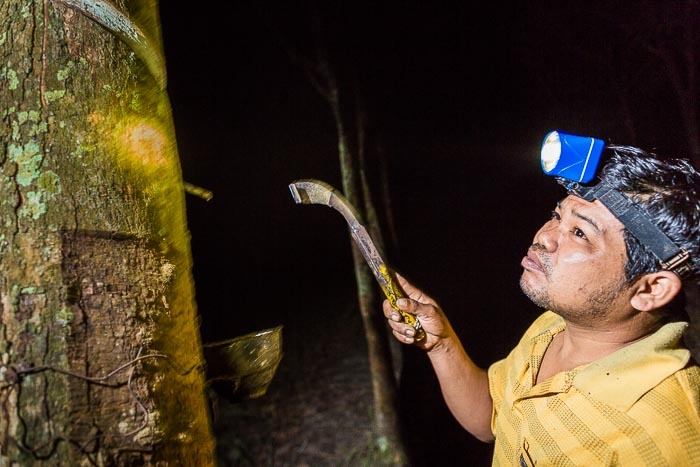 Tappers, wearing a headlamp so they can see what they're doing, walk through their groves in the dark, cutting a small incision in the bark of the tree. The white latex starts flowing into a small bowl hung on the tree and the tapper moves on to the next tree. They don't work in the rain or when it threatens to rain (because rain water would collect in the bowl and contaminate the rubber). The rainy season is the slow season for rubber farmers. Rubber drips down the tree and collects in a small bowl suspended on the tree. 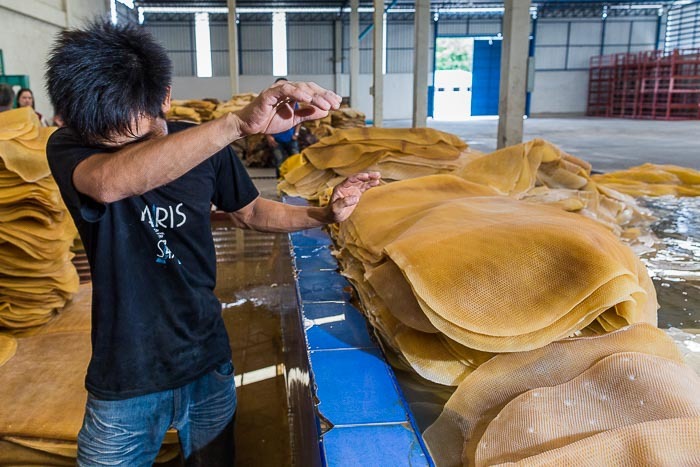 I went out to Rayong and Chonburi provinces this week to photograph the rubber industry. The work was cut short by the weather, not only is it the rainy season, but a rainy front moved in and it rained pretty much constantly while we were out there. I had a chance to photograph only one tapper, and then only for a few minutes. He went out hoping to tap his trees when the rain came. I followed him for about 10 minutes and then he said "finished." I didn't notice it raining but I did hear a sort of drumming that I couldn't place. The "drumming" turned out to be rain hitting the leaves at the top of the canopy. Rubber trees have a large leafy canopy that keeps the ground in perpetual darkness and acts as a leaky umbrella. You hear the rain well before you feel it. We left the rubber farm and went into town to photograph workers in the processing plants. When tappers can't collect rubber they can't sell rubber and the processing plants were not very busy. 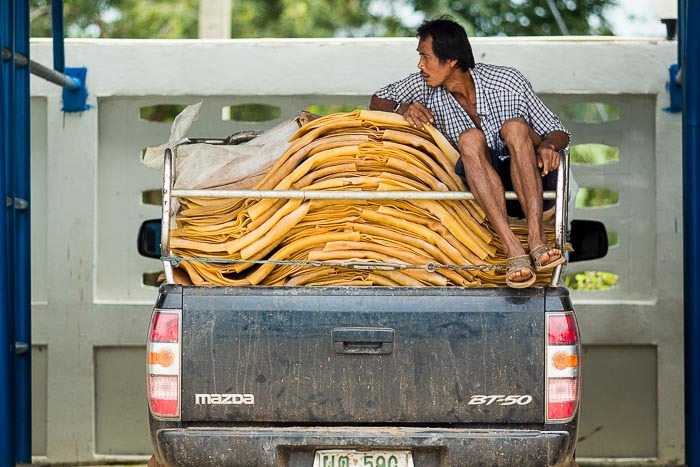 A tapper on the back of his pickup truck waits to sell a load of rubber sheets from rubber he collected over about a month's time. He said he is now making less than ⅓ of what he was making in 2012. I asked him how he was making up the difference. "We buy less." was all he said. The rubber processing cooperative we visited in Chonburi normally employs about 200 people in the smoker (rubber sheets are "smoked" to dry them). There were fewer than 35 people working in the smoker when we were there. It's an interesting example of the interconnectivity of life. I asked why there were so few people working in the smoker. A manager said it was a combination of factors. Many of their employees were Cambodian migrants (Rayong and Chonburi are close to the Cambodian border) and the Cambodians fled Thailand en masse in June. A few had returned to the rubber plantations but most had not. The cooperative was hiring Burmese migrants to replace the Cambodian migrants. Because it was the rainy season, there was need for fewer workers and because the price crashed they were not able to hire a full crew. A worker in the smoker wipes his brow while throwing rubber sheets into a pool of water to wash them. 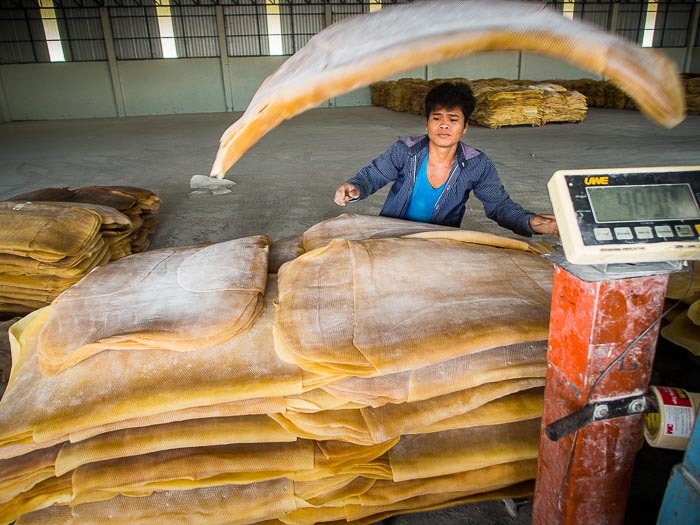 Rubber sheets are washed to remove surface contaminants and then put into a smoker and dried. They're in the smokers, which burn mango wood, for three to five days. The smell is unique. Not really bad, but a combination of being near a meat smoker and the world's biggest rubber band. Workers start by rinsing the rubber sheets then hang them on racks before loading the racks into the giant smoker. The racks of rubber are stacked together and are the equivalent of three stories tall. A migrant worker hangs wet rubber sheets on a drying rack. Dried rubber sheets are pulled off the racks after they come out of the smoker. 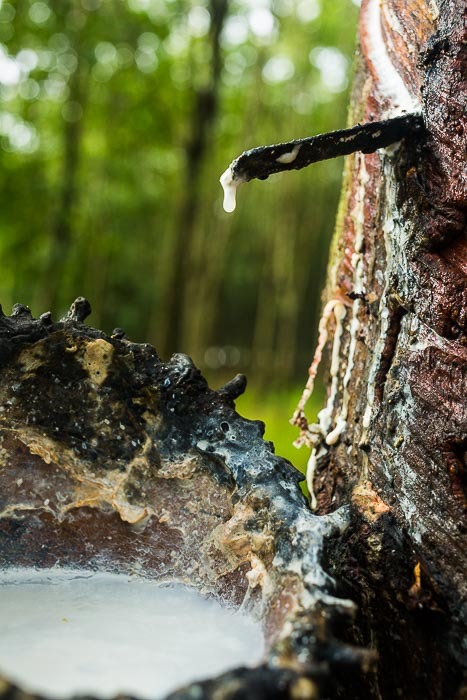 What's the solution to the Thai rubber crisis? No one seems to really know. Thai rubber farmers are hoping for government intervention. They cite the ill fated "rice pledging scheme" of the now deposed government of Yingluck Shinawatra as one possibility. That program helped some rice farmers, but it was allegedly mismanaged (criminal investigations are ongoing) and it nearly bankrupted the government. Politics was a factor in the creation of the rubber crisis. 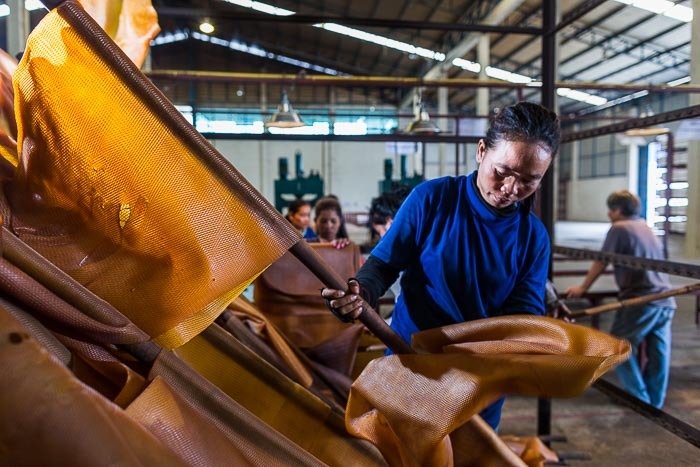 Rubber farmers, especially in the southern heart of the Thai rubber industry, tend to be Democrats and opponents of the elected Pheu Thai government, that governed Thailand from 2011 until May, 2014. Rubber farmers helped fund the anti-government protests last year and the government had no incentive to help them. Rubber farmers are hoping the military government will decide to help them, but the military has so far been hesitant to kickstart another populist program that benefits a special interest group. Rubber farmers are in it for the long haul. It can be four to five years from the time a tree is planted until it first produces. Once trees start producing rubber they can be tapped for more than 20 years. This isn't something the farmers can just walk away from or rip out and replant with rice or corn, although some may replace their rubber trees with palm oil. 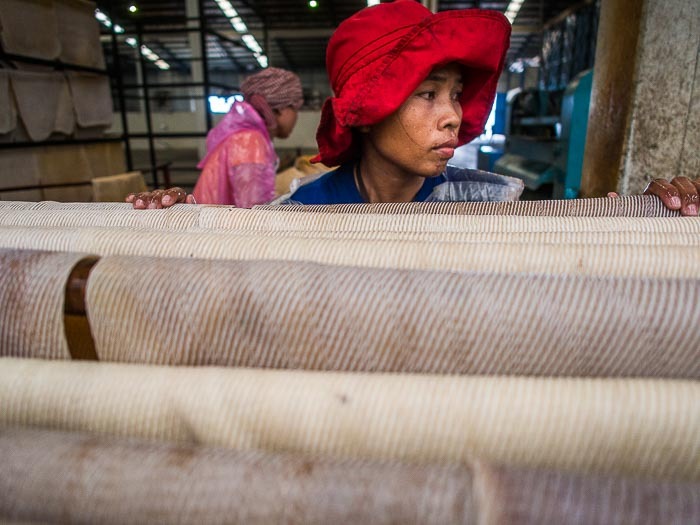 There are more photos from the Thai rubber industry in my archive or available from ZUMA Press.